Before I headed down the beach, I was recalling my travel to China back in 1989. 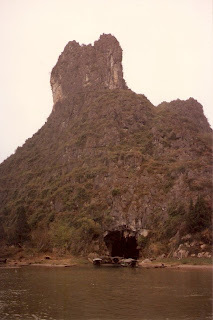 I left you in Guilin, on the River Li, about to take a ferry trip to Yangshuo. 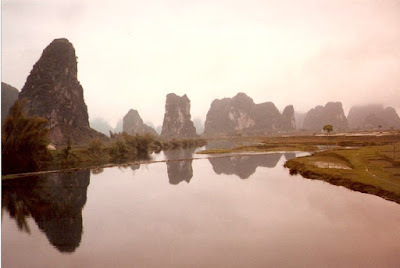 As an obsessive travel forum/ travel blog lurker, it seems to me that the ferry trip from Guilin to Yangshuo is these days denigrated as a bit of a tourist trap, and that only the lower reaches are worth the expense of jumping on a boat to glide along a river surrounded by karst peaks. 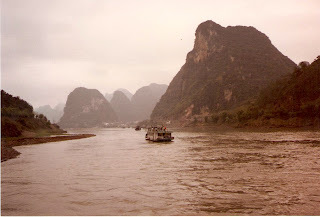 I've also read similar things about numerous other boat trips along rivers throughout Asia, and basically, there's no consensus really. There's those that put down any trip that includes the more middle class package tourist, unless it's possible to see the real estate by a more "real' method. This was the logic around the well heeled tourists taking the tour boats, and the backpackers taking the felucca down the Nile in Egypt. Then there's those like me, that realise that the real estate is what we've come to see, and that beauty is in the eye of the beholder. If a person is more concerned about the comfort, or lack thereof, of their chosen mode of transport, then I suspect they won't have the inclination to enjoy the spectacular scenery they are floating through. So live and let live. 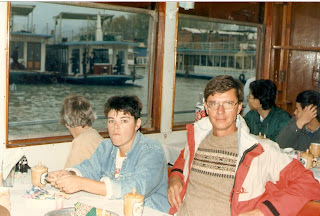 Anyway, back in 1989 I can assure you the River Li cruise was already a tourist trap. 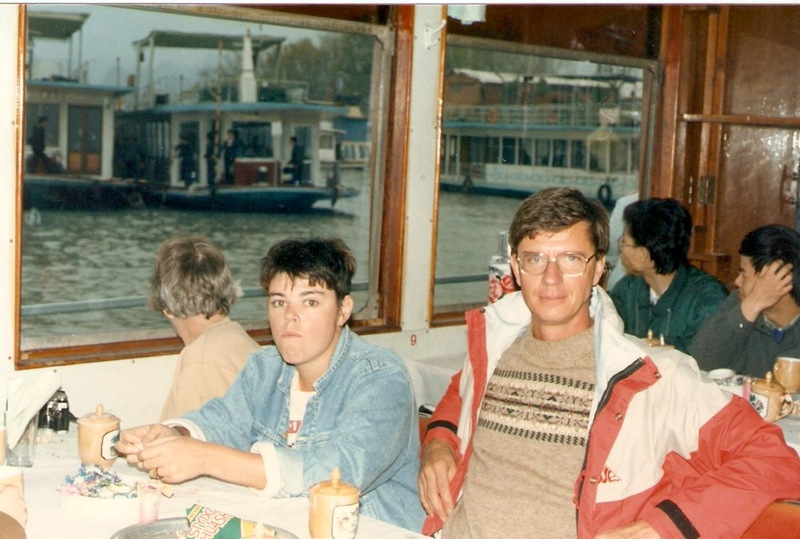 But I kind of get a kick out of this anyway (I clearly recall us all doing brown eyes from our felucca at passing cruise boats all those years ago! ), as I enjoy watching other people and how they deal with a different environment and culture. And the whole touring palaver was new to me back then, everything fascinated me. In fact it still does. The cruise was spectacular: karst peaks, mist, clouds, moody river, verdant green paddy fields, and occasional fishermen. There were at least 10 ferry boats, and there was lots of hooting of horns and possibly some racing shenanigans going on between boat captains. We were the only westerners on our boat, the rest being from Taiwan and Japan and after considerable jostling, the boats set off. The first part was thick with peaks surrounding us on all sides, the middle section was undulating pastures, then the peaks returned as we approached Yangshuo. Arriving in this small town we were shocked to see so many tourists alighting, the numerous signs in English and to realise we were in some sort of different place to anywhere we'd been before. 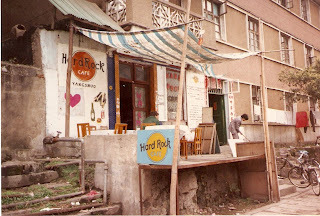 Yes, this was our first backpacker ghetto. Over the next day and a half mum and I were left to our own devices. We were installed in one of the better hotels in town, although the room was damp, the toilet didn't flush and there was no hot water. Or electricity a good deal of the time either. We checked in and headed out, passing The Hard Rock Cafe, Charlie Chaplin's Bar and the Sheraton Hotel. We had a wonderful giggle at the Chinglish and had a first encounter with the ethnic minority people of Southern China. Little did I know that 20 years later I would spend over 3 months exploring these interesting cultures of SE Asia, absolutely fascinated with their textiles and needlework. Next we did some money changing. In 1989 foreigners could only exchange their western currency for Foreign Exchange Certificates, or FECs. The people's money, Renminbi (RMB), could not be exchanged into foreign currency, and could not be used in the government owned Friendship Stores to buy overseas consumer goods, like TVs. Funny to think that back then everything wasn't made in China! The locals were very keen to get hold of FECs, and tourists were keen to get hold of Renminbi to pay for day to day expenses, especially as the exchange rate was about 1.8 RMB to 1 FEC. 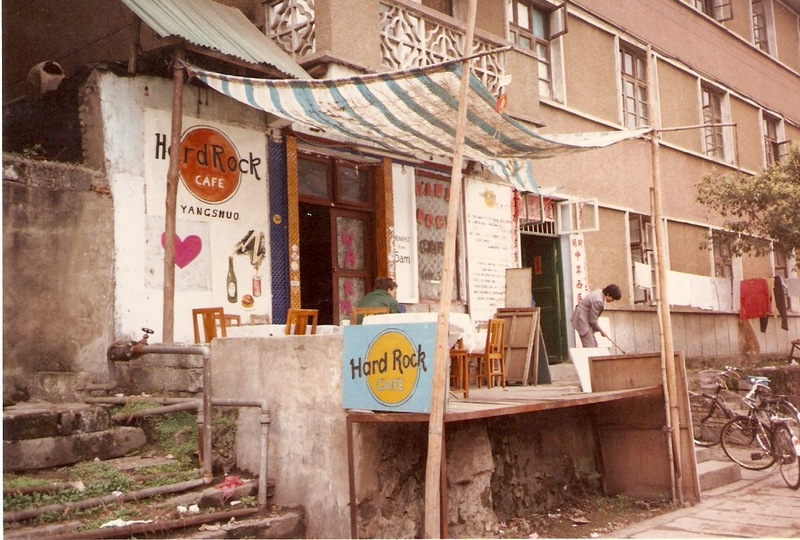 The only way to get RMB was to use the black market, often small private stallholders selling tourist souvenirs. Whilst mum rode shotgun, I did the deal, and we emerged with a fistful of real chinese money. Boy we were proud of ourselves!! The difference between these two forms of currency meant both sides had the opportunity to get a good deal. As both FECs and RMB were in "Yuan", the official currency, shopkeepers would bargain in Yuan but expect FEC. Imagine their disappointment when the tourist gives them RMB instead. Score one to the tourist!! And if the tourist travelled using RMB the cost of living was so cheap. It wasn't totally all on the tourist's side though, because transportation and entry prices to tourist sites were much more expensive, and often only accepted in FECs. When the Chinese government finally discarded the two tiered monetary system they also outlawed different pricing tiers as well. But that combination of fear, danger and joy experienced when playing the black market for the first time is an experience I will always cherish. Next morning we decided to head out of town on bicycles to explore the countryside. Mum's newly acquired asthma had resolved by now, but it appeared that the saying "just like riding a bike" isn't totally to be believed. I am sure my mother has ridden a bike in her youth, but do you think she could manage to stay upright on a bog standard Chinese bike? No way Jose, she needed trainer wheels, not an available extra option at the bike hire place outside the Yangshuo Hotel. What to do? We'd been in China for at least a week by now, and had not failed to notice that riding a bike is rarely a solo affair. Mum, dad, three kids, two chickens and a pig could be easily accommodated on one rusty Chinese treadly by the average peasant, so why were we getting all hot under the collar that the old lady couldn't ride her own bike? Admittedly the steel carrier rack would not have been all that comfortable, but mum cheerfully perched herself sidesaddle behind me and we peddled off into the countryside. Let me tell you, when a westerner cycles past with a more senior western lady perched behind her, Chinese style, on one bicycle, most peasants fall off their bicycles themselves. A few westerners did too! We laughed a lot that day, both with and at the locals, saw some beautiful scenery, and only once ended up in a ditch when mum tried to move her weight to get a little more comfy. That evening we visited one of the backpacker bars for an Irish Coffee, discovered banana pancakes for the very first time, and had my first exposure to the loud fat arrogant American tourist. 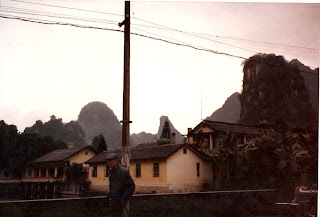 The next day we drove back to Guilin and prepared to fly on to Xi'an, home of the terracotta warriors.